Are used to attract animals (and humans) with their color. Our current Price List is containing all compounds presently in stock, including source and purity. These carotenoids can be delivered within a few days. The carotenoids are prepared either by extraction from natural sources or by chemical synthesis. Samples are supplied in sealed ampoules, under nitrogen, to ensure stability. Usually purity (HPLC, % area) is ≥ 95%. Although the ampoules are labelled as 1 mg or 5 mg, these values are approximate. We guarantee, however, that the actual content will be not less than the stated amount. Whenever possible, they are supplied in crystalline form with the exception of (E/Z)-phytoene and (E/Z)-phytofluene which are oily at ambient temperature. All compounds are fully characterized and analytical data (HPLC, UV/Vis spectra) as a Data Sheet, as well as a Safety Data Sheet (SDS or MSDS) are provided with the samples. Carotenoids on this list must be reanalysed and can be delivered usually within weeks. This range is expanding all the time! For unusual carotenoids and larger quantities, even if you don’t think it will be available, enquire! We will rapidly give you our assessment of whether it is feasible, how we would do it, and what we estimate it would cost. Demands for preparation of larger quantities (100mg or more) of carotenoids may be realized by our collaboration with a laboratory that is highly specialized in polyene and carotenoid synthesis. N.B. these products are not for human application. Another service is filling ampoules under inert gas. The transfer of small amounts of carotenoids into ampoules may be very demanding. We have developed a procedure for filling manually ten to several hundred ampoules with a required amount. This service is offered not only for carotenoids, though highly toxic compounds are excluded. 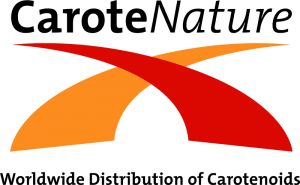 In the year 2000, CaroteNature was started with the aim to distribute authentic samples of a large number of carotenoids for analytical purposes to researchers in the carotenoid field worldwide. Since its foundation, CaroteNature has grown steadily. We have exported our products to more than 60 countries all over the world and delivered to 175 universities. Our current stock of ready-for-shipment products includes almost 100 different carotenoids – the majority are available commercially only from our company. These figures clearly demonstrate that CaroteNature is the worldwide leader in the distribution of carotenoids of high purity for analytical purposes. We also offer services such as analysis of carotenoids in plant and other extracts, custom synthesis or isolation, filling ampoules under inert gas and consultancy in the field of carotenoids. We are cooperating with a number of laboratories of high reputation in the various fields of carotenoid research to ensure the high quality of our products and services. CaroteNature has been appointed sole distributor of the reprinted Volumes 1A, 1B, 2 and 3 of the book series „Carotenoids“. In addition, also the „Handbook“ and Volume 4 and 5 are available at CaroteNature. What is special about CaroteNature? This company is operated by leading carotenoid chemists, each with decades of experience in carotenoid isolation, synthesis and analysis, with advice from other leading scientists in the carotenoid field, and support from laboratories with a long tradition in carotenoid chemistry and biochemistry. Therefore, CaroteNature is uniquely able to produce and supply a wide range of carotenoids and services of high quality and with a high level of quality control.